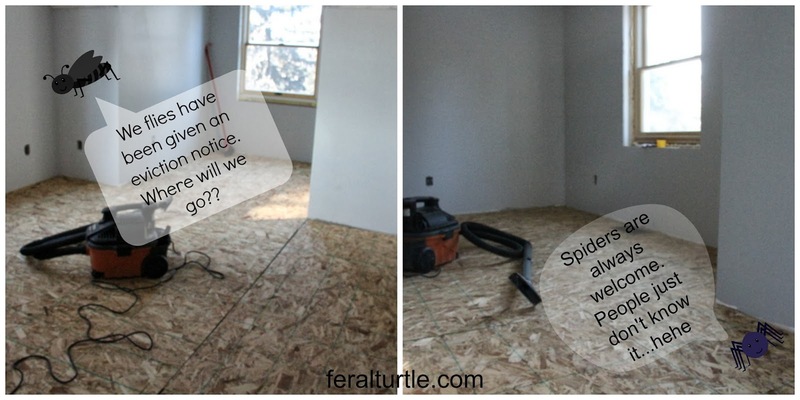 A Feral Turtle's old house is like a complicated math problem! a foot full of slivers! You say, "Pffffft, that's not complicated!" Well it is if you've been inhaling squeezing a tube of glue all day! A wee bit of floor leveling compound goes in all the right places! Laying a subfloor has its perks! 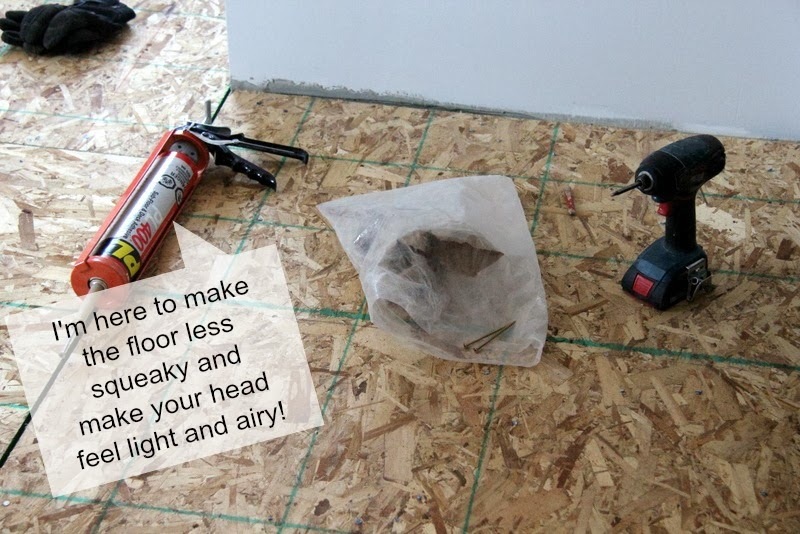 If you love the smell of floor glue, you are in luck! I have the old glue withdrawal headache. But on the plus side, the subfloor is done! would have flooded the room. translates to bloody, bloody cold in Fahrenheit! Look as happiness floods the room! 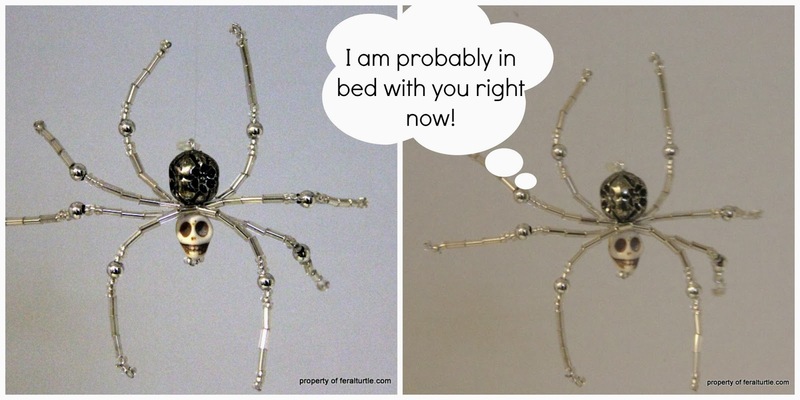 Rumor has it you are never more than three feet away from a spider at any given moment! I could apply some more glue and be happy again! You can go back one episode and check out the paint here! Oh I so get this post - all of our floors are uneven - I literally stumbled into the wall for the first 2 weeks I woke up in this house - like a drunk LMHO. We did that self leveling thing in the kitchen - but it's still off - and the worst thing is it leads to the dining room and hallway - so now there's a ledge................looks like yours worked out perfectly!!! LOl another spider, but they get rid of flies personally I prefer spiders over flies, at least they're not germy and all over you. Glue sniffing...mkay. I can't believe you're still waiting on the tiles do you have crack hidden with them, that's taken ages! Come do my floors I need some help! The ground floor of my cottage was entirelly redone and the company managed to make it unveven (less than before, but still the cats can play with the ball by themselves as it rolls really good in the dining-room). So I understand the kind of happy dance you can do for having an even floor. Wow ? - 27 is in celsius! I'm definitely not coming for a ride in my pink corvette! I'm off to get my pink parka, pink gloves and pink boots! Oh the perk of a legal high in a major project! Always tough to face the music the day after! LOL! But..you've done it and the rewards will be so worth it. Thanks for reminding me that spiders are always nearby. Ugh. But...I have to say that your skull spider is my favorite one yet and I want to make one for Halloween!! I am a nut job, and just love the smell of all things construction. I'd probably be one very happy camper if we had to level our floors hahaha! And I am soooo grossed out thinking that spiders are that close at all times. The real ones just aren't as cool as your cute little beaded guys! I think I'm getting a headache just thinking about the fumes! And I have no idea how someone (you) can make me love spiders when I hate spiders. Wow! Dani and I are definitely coming over. Free fumes, mass quantities of booze in the basement and a cozy little snuggle. Your house is the place to be! Love the skull spider! In your case I think you're never more than one feet away from one of your spiders :) I've never had to deal with uneven floors and I hope they don't cross my path, it must be a nightmare!